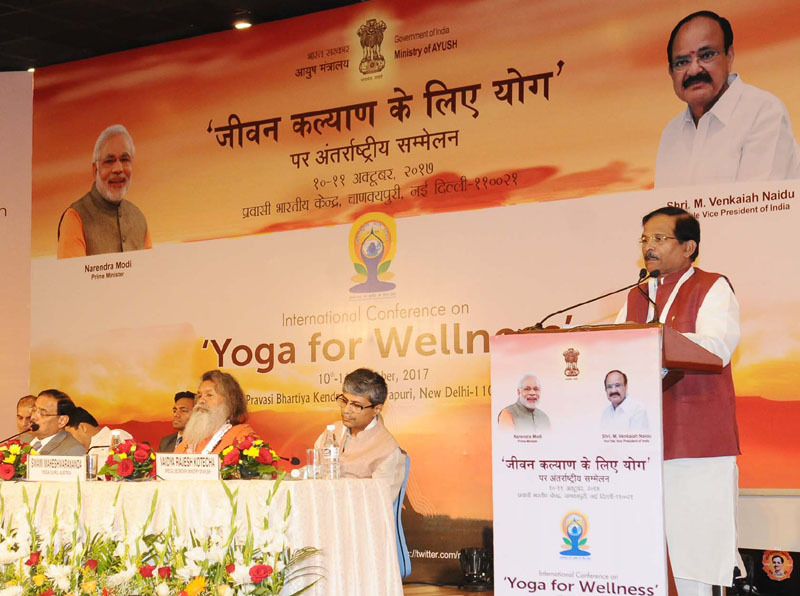 The Minister of State for AYUSH (Independent Charge), Shri Shripad Yesso Naik addressing the 3rd International Yoga Conference, in New Delhi on October 10, 2017. New Delhi : The Vice President of India, Shri M. Venkaiah Naidu inaugurated the 3rd International Conference on Yoga in New Delhi today. The theme of this year’s conference is “Yoga for Wellness”. Addressing the participants, Shri Venkaiah Naidu said that the ancient science of Yoga is India’s invaluable gift to the modern world. He further said that we believe that knowledge and science should be transmitted freely for the welfare of the entire world. The Vice President explained that Yoga is the mother of all exercises and provides physical fitness, mental alertness as well as spiritual succour. He further said that yoga has nothing to do with religion as some people unfortunately attribute religious overtones to this ancient scientific system. The Vice President expressed his appreciation that the conference will focus on seeking solutions to contemporary health problems caused by modern stressful lifestyle. The conference is being organized by the Ministry of AYUSH as a part of year long events being organized to celebrate 21st June as International Day of Yoga. Yoga experts, Yoga Gurus, Researchers and policy makers among others from 44 countries are attending the conference. Addressing the participants, the Minister of State (Independent Charge) for AYUSH, Shri Shripad Yesso Naik said that today, the world is facing the challenge of growing prevalence of non-communicable diseases and stress related health problems. He further said that the youth is the most affected due to an erratic lifestyle. The Minister emphasized that Yoga is the only way to provide sustainable solutions for health problems and bring peace in life. Shri Shripad Naik informed that the Central Council for Research in Yoga & Naturopathy, Morarji Desai National Institute of Yoga, New Delhi, National Institute of Naturopathy, Pune under the Ministry of AYUSH are putting vigorous efforts to promote standardization and scientific acumen of Yoga and Naturopathy. 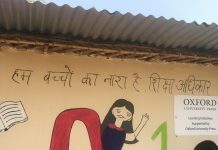 He said that the Council has decided to set up four Central Research Institutes each with 100 bedded hospital and two Post-Graduate Institutes of Yoga & Naturopathy – one at Jhajjar, Haryana and another at Nagamangala, Karnataka. The Ministry is also in the process of establishing National Level Institutes of Yoga and Naturopathy in Goa and Panchkula (Haryana) to impart post graduate education and research and tertiary health care services. Shri Naik said that a National Board has been constituted for the promotion and development of Yoga & Naturopathy with the objective of standardization, quality control and accreditation of education and profession. Secretary, AYUSH, Shri C. K. Mishra said that due to the initiatives and leadership of the Prime Minister, yoga is no longer an Indian phenomenon but has become a global one. Wellness is about a healthy human being and yoga provides both internal and external strength which gives overall wellness, he explained. Special Secretary AYUSH, Shri Vaidya Rajesh Kotecha; Founder Vice Chancellor of S-VYASA University, Shri H.R. Nagendra; renowned Yoga Guru in Austria, Swami Maheshwarananda; and Associate Professor from Boston University, Ms. Chris Streeter were also present at the inaugural function. The two day conference consists of seven technical sessions and a panel discussion on different aspects of Yoga and Wellness including recent research trends, Integrated medicine, non communicable diseases, mental health, women health, cancer, pain management and policy making. More than 25 national and international experts will be the speakers and 11 highly reckoned resource persons of Yoga and Medical field as Chairpersons and Co-chairpersons of the technical sessions. This conference will provide a common platform for the AYUSH and Allopathy Practitioners, Researchers, Academicians, Policy Makers and students and enable them to capture and understand various dimensions of the yoga for wellness. The International Conference has been organized with the technical and logistic support of Central Council for Research in Yoga & Naturopathy and Moraji Desai National Institute of Yoga and it is an attempt to project the potential of Yoga in the management of certain health problems and for promotion of wellness and for sharing of scientific experiences. This will be the third International Conference on Yoga organized by Ministry of AYUSH. The last two International conferences on the themes of ‘Yoga for Holistic Health’ and ‘Yoga for Body and Beyond’ were organized in 2015 and 2016 respectively.